Bowser Manufacturing is a United States manufacturer of model railroad equipment. The company produces freight cars, diesel locomotives, and streetcars in HO scale, and N scale freight cars. They also sell brass and plastic detail parts by Cal Scale and Cary, and pewter scenics by Selly. Bowser carries over 70 model railroading related lines for sale to dealers. The company is located in Montoursville, PA. The original Bowser Manufacturing Co. was started by Bill Bowser in 1946. During 1944 Bill was a machinist working for the Naval Ordinance Plant in Indianapolis, Indiana. His friend George Hockaday asked if he was able to produce some hobby parts for him in HO scale, since they were in short supply due to wartime rationing. This sparked Bill's interest, and he subsequently acquired the inventory of spare parts from a company called Knapp that had been producing a popular HO scale brass Mountain steam locomotive kit. Bill paid off a $200 debt owed by Knapp to Superior Casting in Chicago, and the inventory of boiler castings, frames, wheel sets, a few motors, and some valve gear parts was released. Upon further inspection however, Bill Bowser discovered that many of the key parts such as the loco frame and drivers, were not made to scale and suffered from manufacturing defects. Bowser set out to create a more accurate product, and began the task of redesigning theses parts to the proper scale. He purchased the master pattern for the Knapp Mountain loco from Superior Casting Company for $800.00. While Bowser had solved the production issue, he did not have enough funds to begin manufacturing his steam locomotive kit. Donald Acheson became Bowser's silent partner providing enough working capital to put the model kit into production. In 1946 Bowser relocated his family to California to launch his model railroad manufacturing business. He purchased land and began constructing a small factory. Initial advertisements for Bowser's 4-8-2 Mountain HO scale steam locomotive kit were placed in the Model Railroader magazine in November of 1948. At that time, the company produced only the one locomotive, the Mountain, which had a cast brass boiler that is no longer available. Though the kit was now available for purchase, design flaws where the insulation on the armature wiring would melt causing an internal short were discovered in the electric motor used to power the model. To make matters worse, it was discovered that the person soldering the armature connections to the commutator was using too much flux paste. When the motor got hot, the paste would liquefy and seep into the armature wiring. Since flux is acidic, this would eat away the insulation and also cause a short circuit. If all this was not bad enough, train hobbyists were cleaning the track with steel wool and residue fibers from the steel wool were being pulled into the motor by the magnet creating yet another way to cause a short circuit. Bowser then redesigned the motor from scratch, calling this new design the 'Supermotor.' The fiber insulation was replaced with glass insulation, the wire was changed to double coated formex, and the commutator terminals were pretinned (coated with solder) so that flux was not needed. A special baked formex varnish was applied over the armature wiring to protect it. The first five-hundred motors were then 100 percent tested to assure quality. It was sometime later that Bowser, located in Redlands, CA, developed and produced the NYC K-11 4-6-2 Pacific and the UP Arc-1 4-6-6-4 Challenger. The molds for the UP Challenger were made by Karl Wenzlaff, one of the top die makers in the country. These two locomotives were produced by Bowser for many years. Learning from the Mountain project, many parts were cast from zamac instead of brass, lowering cost since parts could be produced in automated die-casting machines. The new K-11 Pacific locomotive kit was brought to market in 1951, and introduced many improvements over the previous Mountain offering. The K-11 was a well known engine that was in common use on many railroads. In HO scale the model would be a good size and could negotiate the small radius curves found on many layouts. The Pacific parts were mass produced using steel dies in an automated die casting machine. Also, some engine detail was left off in order to keep costs down. Although leaving detail off upset the more avid, purist modelers, it was a necessary compromise. The K-11 kit was sold with the same cast brass tender that was used on the Mountain. To create the Challenger design, Bill had to rescale about 6000 dimensions from Union Pacific blueprints. Bill Bowser was a skilled machinist and utilized his talents to produce one of the first lines of accurately scaled steam locomotive kits in HO scale. When the Challenger kit began shipping it did not have a tender. Around June of 1951 a Semi-Vanderbilt wood tender was added. When the Challenger went into production, Bowser Manufacturing's financial postion was still pretty poor. In 1955, Bowser's financial partner Donald Acheson forced Bowser out of the company by enforcing a buyout clause in their agreement. Since the factory was now in full production at the time of Bill Bowser's ouster, Acheson was able to stockpile a considerable amount of kits to sell over the next few years. On May 1, 1961, the Bowser name, tooling and inventory was purchased from Acheson by Lewis and Shirlee English and moved from Redlands, CA to the basement of their home in Muncy, PA. When Penn Line was sold at bankruptcy sale in 1963 Lew English and his Bowser Manufacturing purchased the tooling and inventory for the 6 prototype Pennsylvania RR steam locomotives. This encompassed the E-6 Atlantic, H-9 Consolidation, I-1 Decapod, K-4 Pacific, L-1 Mikado, and T-1 4-4-4-4. The whole English family worked part-time on these engines, but were unable to get them all ready at once in a small basement operation, so in 1965 it was decided to work full time on Bowser and the company moved to Montoursville, PA. which is next to Williamsport, PA. Shortly thereafter, the Pennsylvania Scale Models line of trolleys was purchased from Felix Bass. PSM had produced a 1945 all-electric PCC streetcar, a 1906 Brill Semi-Convertible streetcar and a 1930 Lightweight Interurban. These were three zamac bodied kits with a then revolutionary motor mounted on the power truck which allowed operation on very small radius curves. These kits were the basis of HO traction modeling for many years. This acquisition added the HO Brill, IRR and PCC trolleys to the Bowser line. Later dies were made for the LVT Liberty Belle and a free-lance Jewett Combine. In 1976 both sons, Lewis K. English Jr. and Lee K. English, came to work at Bowser. Lew Jr. took over the office management and wholesale operations while Lee became the manager of the production department. Somewhat later Lew's wife, Bea, became the company's Credit Manager. All locomotives and trolleys require electric motors which were originally supplied by Pittman. After Pittman advised that they no longer wanted to make hobby motors, the tooling for the motors was acquired and Bowser began to produce them. This assured a controlled and continued supply of the popular DC-71 motor and permitted upgrade to all Bowser engines to utilize that powerful motor. Even the NYC K-11 boiler was revised to accept the DC-71 motor. The Pittman tooling included dies for the Pittman 'O' gauge Brill trolley which Bowser also began to produce. Later a die was made for an 'O' gauge Birney 4-wheel trolley which Bowser made for several years. The Bowser 'O' gauge trolleys came decorated for many different systems and were available for 2-rail or 3-rail track. The chassis and power train were available for separate sale. Bowser eventually acquired Selley Finishing Touches, of Winter Haven, FL, and from Life-Like the tooling for some of the Varney HO steam locomotives and the former Penn Line GG-1. The Varney tooling included the Casey Jones, Old Lady, Dockside, box cars, reefers and most of the Aero Train. 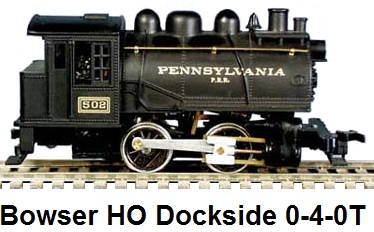 Since the Dockside body was plastic, it was offered by English's Model Railroad Supply, which was a division of Bowser. The Selley items were cast in pewter and included all sorts of figures of passengers, RR crewmen, road gangs, barn yard animals, accessories such as switches, cranes, signal bases, crossing arms, crossbucks, transformers, generators, wheel stops, baggage carts, tools, farm equipment, sign sets, and detail parts such as couplers, searchlights, air tanks, valves, pumps, piping, bolsters, wheels, etc. These items came unpainted. Bowser made an improvement in production by erecting another building and purchasing a die-casting machine so they could perform all their own zinc casting. Doing thier own die casting was a large step forward and encouraged the company to add other locomotives to their line. The Big Boy, which was a combination of two Challenger boilers, was the first. The USRA Mountain was next. From the USRA boiler they designed a free-lance Northern and a USRA 2-10-2. The PRR M-1 and M-1a were introduced late in 1986. The E-6, G-5, H-9, I-1, K-4, and L-1 were all converted from lead to zinc. The PRR A-5 was introduced in February 1992. Since Lew Sr. was a train collector and the company did their own zinc casting, it was decided to make restoration wheels for Lionel Standard gauge and 'O' gauge locomotives. These were very popular sellers, as there were many engines needing repairs. Bowser added turntables to the line which were designed by Charles Farmer of Elmira, NY. These were popular with model railroaders no matter what scale. Bowser sells these turntables in N, HO, S, O, Standard and LGB. They also sell bridges from 8" long to 32" long. In June 1985 Bowser purchased Cal Scale from Mr. John Anderson and Mr. Harry Parker of Fresno, CA and moved it to Montoursville. Initially called Associated Brass Products, Cal Scale was formed by John Anderson, Bruce Bechtold and Harry Parker in 1959. The company owned a foundry under which, they started manufacturing castings for model railroad steam locomotives, using the Cal Scale name. The partnership was a perfect fit for them as Harry supervised the plant, Bruce was a pattern maker, and John was a master die maker.�As pattern maker, Bruce added the diesel detailing parts to the Cal Scale line. The Cal Scale acquisition included thousands of patterns to make many steam engine parts that were used on the Japanese imports and never marketed separately. Full production with this line of thousands of lost-wax brass steam locomotive castings, plastic molded detail parts and wire form parts continues under Bowser as the Cal Scale division. In 1987 some Bowser mechanism kits were adapted to fit a few of the Bachmann steam engine boilers. Under the name of English's Model Railroad Supply, Bowser-made mechanisms were offered for the 2-8-0 Consolidation, 4-8-4 Class J, 4-8-4 Niagara, 4-8-4 Northern/Overland and 4-8-4 GS-4 made by Bachmann or Lionel and the PRR K4. In May 1988 Cary Locomotive Works of Cary, IL became the newest part of Bowser Mfg. Co. after owners Don and Dolores Stromberg experienced health problems and decided to offer their business for sale. Bowser felt that it would fit right in with their existing production. Cary was known for producing soft-metal boilers and shells to put on other manufacturers' models. Cary Locomotive Works had produced its first steam locomotive conversion body in 1958. The line was later expanded to include diesel body units, diesel detail parts, and a large line of lost wax brass detail parts. This acquisition added several cast-metal diesel and steam locomotive bodies, including the General, the Alco S-2, the F-3A, F-3B, E-6A, E-7A and the SW-1500, to the growing Bowser catalog. All the small parts, bodies and boilers were made available, however, the GP-9 shell was discontinued. The other bodies in the Cary line were now produced as zinc die castings. These bodies were designed to fit commercially available drivers of other manufacturers in HO scale, such as old Athearn, Hobbytown, and Proto-Power West, etc. The basic body in these conversion kits was a one piece casting, with some parts, such as roof ventilators, shutters, steps, air horns, etc., cast separately where such parts could not be accurately cast as part of the body. In 1990 the Menzies line of freight car kits was purchased from the D.J. Baker Co. That acquisition included the 40' AAR box car, the 40' & 50' round roof box cars, and 40' reefer. That same year Bowser also purchased a pad printing machine and paint booth. With the pad printing and painting capabilities custom painted and lettered Athearn box cars were offered through English's Model Railroad Supply division of Bowser. In 1991, the molds and masters of Arbour Models, makers of a wide selection of cast steam engine locomotive kits in HO introduced during the 70's and 80's, was purchased from Architectural Models. Arbour was originally founded as a division of a small family run business with roots in the printing industry from the early 1700's by Holme Martin to manufacture HO scale cast metal craftsman kits. These kits were not die-cast. They were cast on a centrifugal casting machine in silicon rubber molds. The metal used was a zinc-cadmium alloy known as Nye-600, not to be confused with Zamac, which was widely used for model die-casting in the 1940's. This metal was nothing like the early zinc-cadmium attempts from the 1930's. The formulas had been strengthened and the material was widely utilized in the jewelry fabrication industry. The zinc-cadmium alloy had a relatively low melt temperature and was appropriate for the silicone rubber molds, which could only withstand temperatures as high as 400 degrees. Arbour kits required the craftsman to perfrom a lot of the filing, fitting, tapping, truing and assembling, unlike those general modeling kits traditionally made by the likes of Bowser, MDC, Keystone or even Varney. Over time, Arbour switched to using Antimony alloy to improve the quality of the castings. Arbour had produced 11 different locomotive kits including an Allegheny 2-6-6-6, Sierra 4-6-0, Sylvania 2-6-0, PRR 0-4-0, PRR 0-4-0T, 2-8-4 Berkshires (both C&O and NPR), and a PRR 2-10-4 Texas. In development when the casting business was sold off in 1983 was a C&O 0-8-0, a PRR 0-6-0 and a S1 electric. The Class H8 2-6-6-6 Allegheny was a complete rework of the old lost wax brass Winton kits from the late 1950's. Arbour had also developed a unique product called the Gandydancer® which was a track planning template kit available in both HO and N scales. In February of 1992, the dummy Aero Train was finished and made available in five road names. Also in 1991 construction of molds for the PRR N-5c (porthole) caboose was started. This was made available in June of 1992. Bowser then had molds made for the PRR H-21a 4 bay hopper car, which became available in June of 1993, and the PRR N-5 caboose, which became available in November of 1993. The molds for the PRR H-22a 4 bay hopper were completed in January of 1994 and became available in March 1994. The mold for the X-31a 40' box car was completed in November of 1994. The molds for the X-32 were completed in March of 1995. The molds for the RoadRailer� were completed in August of 1995. The 53' Plate Wall highway trailer was also completed in August of 1995. The H-43 100 ton triple hopper was completed in October of 1995. Tooling for the 70 Ton 2 bay Covered Hopper was finished in 1998 and the F-30a Flat car and the GS gondola in 1998. In July of 1993 a new mold was made for the PRR K-4 Pacific and the PRR L-1 Mikado. This boiler was now a zinc die casting. Also in November of 1993 the mold for a correct PRR I-1 Decapod boiler was started. It was finished in September 1995. In March of 1994, the USRA Light Pacific Kit was finished. This kit used a Cary boiler with a Bowser mechanism. This was the first Bowser kit to include all the lost wax brass superdetail parts with the basic kit. Also, the boiler and tender were drilled for all of the superdetail parts. In October of 1995 the USRA Light Mikado and a superdetail kit was finished. Future plans included a USRA Heavy Pacific, USRA Heavy Mikado and USRA Heavy Decapod. In July of 1997 marketing for the ACF 2 Bay coverd hopper began. January 1998 saw introductions of a Corgi mechanism and the USRA Light Mike. In July of 1999 Bowser acquired the Delaware Valley Car Company, makers of N scale freight cars. The next several years saw improvements made to the line, including new Clam Shell H-21 & H-22 Hopper molds, a new HO deck detail kit for turntables, new tooling for the Clerestory Roof for the 'O' trolleys, new tooling to make the Side Door Roadrailer, new molds for the PRR K-9 Stock Car, new molds for X-31f Turtle Roof box car, new molds for K-11 Stock car, new N Scale N-5 Caboose tooling, and a new DC-71 motor. One of the biggest changes came in 1999 with development of new tooling for the mechanism for the HO line of metal bodied trolley cars. Bowser CEO Lee K. English recognized that the four HO scale trolley cars his company was producing had limited future unless the drive was improved and the cars were available ready-to-run. He and his father, Lew, had made some changes to the original drives and the car body shells for the Brill Suburban, the Streamlined PCC, the IRR Lightweight Interurban and the Liberty Bell Interurban (LVT 800 series Jewett), which were acquired from Felix Bass' Pennsylvania Scale Models in the late 1960's. The oval magnets used for the original truck mounted motor design were no longer available. After trying unsuccessfully to fit a commercially available motor vertically into the old design, Lee English decided to go with a totally new design. The new mechanism became widely adopted and was even improved upon by A-Line/Proto Power West who designed a flywheel retrofit kit for the new drive. Bowser also developed a series of conversion mechanisms with floors for its older shells and the Bowser Brill and PCC trolleys. Since the older Bowser drive had been a staple in the HO scale traction modeling arena for decades and there were other cast shells designed by Q-Car, E&H Traction and others that used the old pre-1999 Bowser traction drive, additional conversion kits were also developed for these trolleys. In July of 2001 the Aero Train loco tooling was reworked by Boyer Machine. Later in 2001, new versions of the Bachmann mechanism kits for K4, Consolidation and J were completed and new tooling was made for a can motor and gear boxes for the Dockside and PRR A-5 locos. In September of 2001 Bowser discontinued custom brass casting for other customers. In 2004 Bowser purchased Stewart Hobbies from Steve Stewart. That acquisition led to many of the Executive Line ready-to-run diesels equipped with sound that were introduced in 2008. In 2011 Bowser decided to discontinue production of its entire line of steam locomotives. In 2014 Bowser announced their new GMD SD40-2 diesel equipped with DCC Loksound. Lew English, Sr, passed away on Feb 3, 2012. He was 93 years old. Lew was survived by his wife Shirlee, four children, Susan, Nancy, Lew Jr., and Lee, and ten grandchildren, and fourteen great grand children and 3 great great grandchildren. Lew was the inspiration for what is now the Bowser Manufacturing Company of Montoursville, PA. He was one of the pioneers in the model train business and was entered into the Model Railroading Hall of Fame in 2003. Bowser Manufacturing continued operations under the direction of Lee K. English, Bowser CEO. Bill Bowser established Bowser Precision Products in 1955, and earned lucrative contracts that he fulfilled initially by leasing back his old factory from Donald Acheson. After a successful engineering career spanning many years he retired to Arizona. He was inducted into the Model Railroad Industry Association (now the Hobby Manufacturers Association) Hall of Fame in 2003. Bill Bowser passed away on December 11, 2009. Link to Bowser Manufacturing Web Site.